Design your own customised photo clocks for unique home decor. Made from high quality stonemax marble resin with a quartz time piece, it's a beautiful addition to your kitchen, living room or bedroom. Available in square or rectangle with a choice of 5 dial designs, including no dial face, you can create the perfect personalised photo clock for your home. Use our online design tools to create your own custom photo clock masterpiece. Coming in square or rectangle and with a choice of five dial face styles, you can create something truly original for your home. Your photos are printed all over in a high definition long-lasting print. 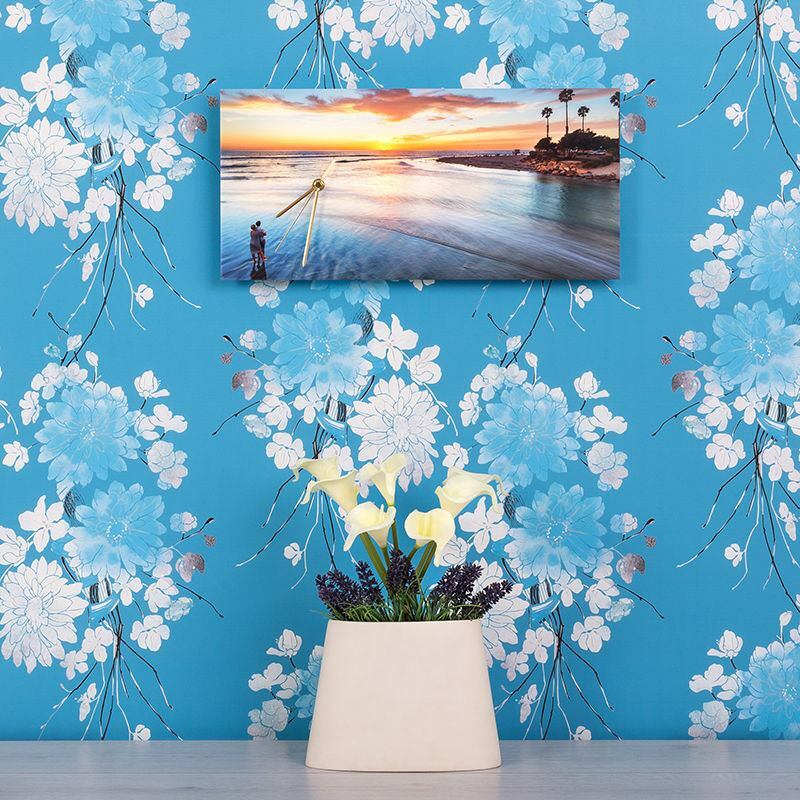 This vibrancy ensures your photo clocks are a stunning feature piece in the room, guaranteed to stop people in their tracks. Design your own personalised photo clock now and create a timeless piece of home decor. Rectangular clocks use a glacier white stonemax resin, whereas a clear plastic with a glossy face is used for the square clock. Very pleased with the results. Good quality printing! Highly recommend. Very quick delivery as well. Site was easy to design original present. Order was dealt with promptly and efficiently. Not seen order as was a gift but told it was good. Fast service, excellent quality product, looked just like I'd hope it would. Like many of our products, these photo clocks come with a quantity discount, saving you money when you buy more than one. This is ideal if you're looking to add an extra decorative touch to several rooms in the home or treat friends and family to a bespoke gift. Assembly: Please note that some assembly is required before you can your personalised photo clock on the wall. It arrives with the hands unattached, to prevent damage during delivery. Simply push them back onto the spindle to get your clock going. All the wall fixtures, AA battery and instructions are included, to ensure a smooth and safe installation. Your personalised photo clock uses one lithium AA battery to run. We manufacture these clocks to order. The rectangular clock is started by selecting a fine piece of stonemax resin - a glacier white material, whereas we use a clear plastic with a glossy face for the square design. This is drilled and the surface and edges are polished before printing. The print goes all over leaving no white bits unless deliberate and part of your design. There is a solid aluminium subframe on the reverse that keeps the photo clocks hung proudly on the wall without any abrasion. The custom square photo clock features the dial in the middle, whilst the rectangle one has the dial placed stylishly to the left, allowing for your photos to make maximum impact. Please consider this when designing your photo clocks, making sure that any important photo features aren't disrupted by the dial time piece. The colour reproduction is amazing, with colours bold, bright and vibrant. Stonemax is a completely smooth non-porous surface, so there's no texture to interfere with your designs. A cute idea for your children's bedroom is to make a personalised photo clock printed with fun characters, helping them to learn how to tell the time. You could even write out the words for 'Half Past' 'Quarter to' 'Quarter Past' as an extra bit of encouragement. Enhance your home with customised photo clocks, printed to match your existing decor. This results in a flawless aesthetic and creates harmony when it comes to your home style. You can print a vintage pattern, bohemian design or something cool and contemporary, depending on your individual taste. As an alternative to photo frames, your custom photo clock can be used to display your favourite family picture. Memories are timeless, so it's only fitting that you print each smiling face on to a clock. You can also create a clock collage if there are too many photos to choose from. Select all photos and create your clock collage with our online montage tool. This is a great housewarming present too, as it's not only a practical item but it doubles as a sentimental keepsake. Print a picture of the happy couple, and the date they moved in for a special gift to celebrate their new home.